Deborah Milano Black Pochette is an elegant black fabric pochette sporting gold flecks and trimmings. Give your eyes a dramatic look on the go with Double Effect Mascara (7002) + 2-in-1 Kajal Eyeliner Gel Pencil - Black in this pochette. 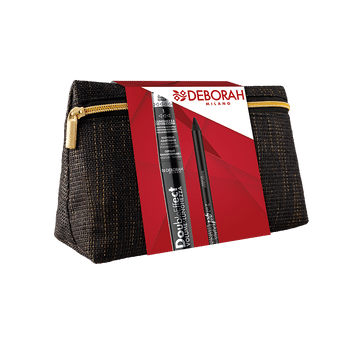 Deborah Milano Double Effect Mascara (7002) (8 ml): A revolutionary 2-in-1 mascara equipped with an innovative Rotating System With Two Positions located on the top of the packaging. Double Effect Volume & Length Mascara Is Ideal For Those Who Want To Get From A Single Product A Deep And Dramatic Look, Eyelashes With Extreme Volume And Maximum Length And Definition, Without Lumps! Deborah Milano 2-in-1 Kajal & eyeliner Gel Pencil - Black (1.4 gm): Formulated with a gel-like consistency that delivers lusciously creamy, rich color. The highly pigmented texture can be used to create marvellous effect both around the outside of the eye and along the inside rim.